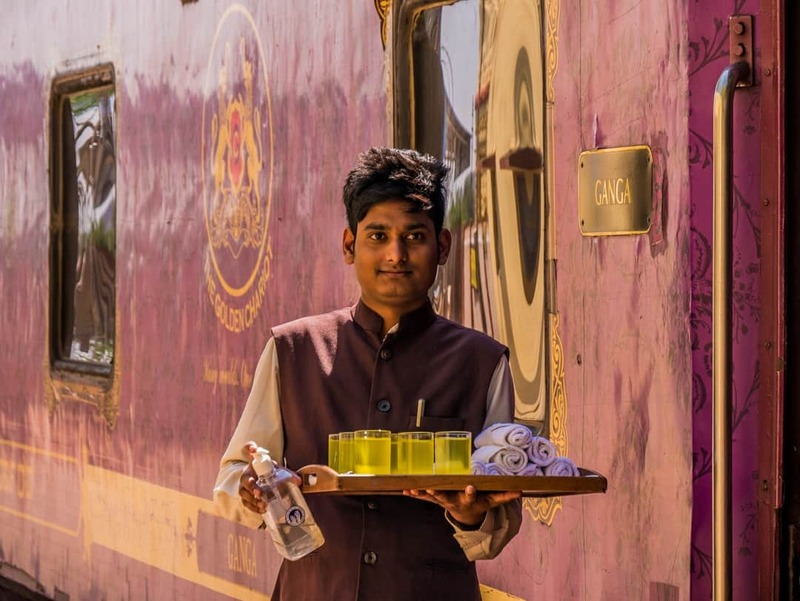 Is taking a luxury train in India really luxurious and is it worth the price tag? 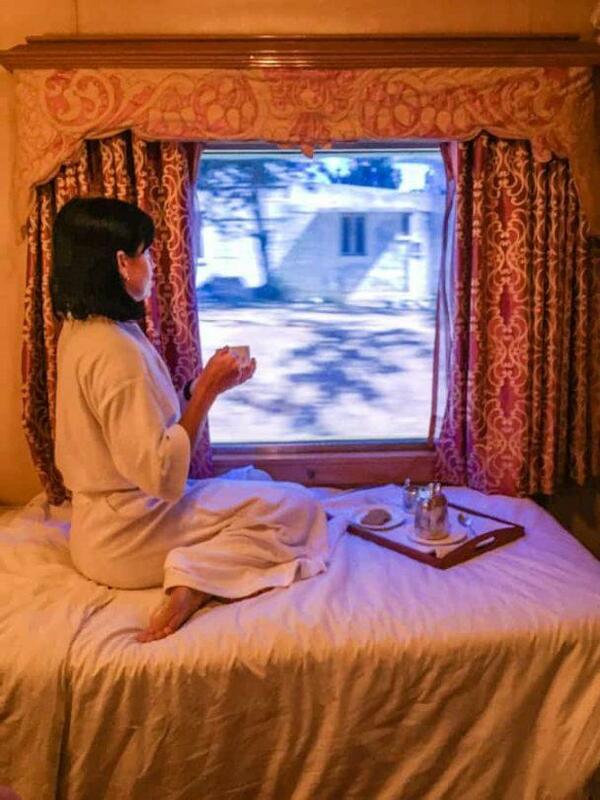 Home > Travel with me > Is taking a luxury train in India really luxurious and is it worth the pricetag? 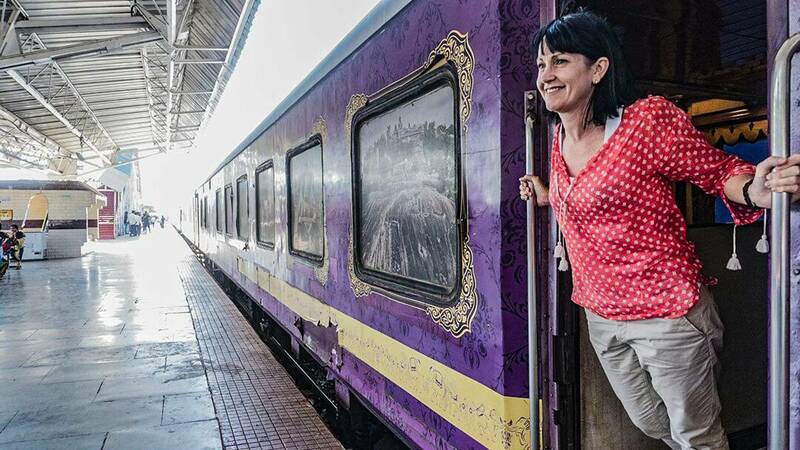 Is taking a luxury train in India really luxurious and is it worth the pricetag? When I first heard that I had been asked to go to India aboard the only luxury train in the south, the Golden Chariot, I was excited but unsure at the same time. I had never heard of luxury trains even existing in India. What would luxury really mean? It’s a highly relative term, meaning such different things to different people. The image of the overloaded, jam-packed trains speeding along the tracks, people piled three high on the roof and hanging out of the doorways wouldn’t shift from my mind. A stereotype or reality? India is a country of great contrast and diversity, and it can be a difficult place to travel. Having spent time in the south and also travelling through the north, I feel that this gave me a much better perspective to be able to review my time aboard the Golden Chariot. Had I only spent a week on the train, I would have reviewed without any direct comparisons of other modes of transport, food, travel arrangements and safety, for example. It would have also given me only a glimpse into Indian life for the world aboard the train is far different to the real Indian world. Surprisingly to most, including me was that there were five luxury trains, although only four are currently operating as tourist trains in India. The standout of the five luxury train tours in India is the Maharajas’ Express, winner of many awards including the recent “World’s leading luxury train”. Key cities of the north are included in the itineraries available on the Maharajas’ Express. Whilst there are a variety of options to choose from, the Golden Triangle super-cities of Delhi, Jaipur and Agra are usually a common inclusion. With all of these trains potentially able to be classified as a “palace on wheels”, one of the trains is officially known as this. The Palace on Wheels takes its passengers on a journey through the historically significant, strategic holding of northern Rajasthan and the Golden Triangle. This is a trip rich in culture and history and picks up all the well-known cities of India. The Deccan Odyssey has itineraries that commence out of Mumbai and picks up more of the western parts of India. Others take in Delhi, Agra and Jaipur, the Golden Triangle favourites. Keep reading for my Golden Chariot train review. The Golden Chariot has two itineraries, the “Pride of the South” and “Southern Splendour”. I travelled on the Pride of the South, starting and ending in Bengaluru (Bangalore), and staying predominantly in the central south region and out to Goa in the West. The major cities on this route are Bengaluru, Mysuru, Srirangapatnam, Kabini, Bandipur, Belur, Halebidu, Shravanabelagola, Hospet, Hampi, Badami and Goa. The Southern Splendour spends more time in the south-east and as far south as Kerala. All of the luxury trains, including the Golden Chariot, operate on a set, seasonal schedule. For future journeys, be sure to check their websites for current information and pricing. There was no mistaking the Golden Chariot with her bright purple exterior standing out on an otherwise dour looking rail platform. But first, I needed to navigate the celebrity-like welcome we had received at the Yeshwanthpur Railway Station, where this luxury train would start and end its journey. With only a limited number of journeys each year, this train attracts a large amount of attention, easily distinguishable from the usual commuter trains that frequent the station. It all happens so fast though, and in hindsight, I wish I was a little more prepared for this moment so as to take full advantage of it all. It all started as I disembarked from our bus, following an initial briefing with all passengers at the Taj West End Hotel. A historic hotel in Bengaluru, my tip would be to book this as your accommodation spot if you are coming to the city ahead of your trip. It’s a touch of luxury and tranquillity in an otherwise crazy, chaotic city of 10 million people. The traffic in Bengaluru can also be frightful, so staying at the same location as the starting point for the train journey makes sense and gives you a much easier start to a long week. Suddenly, the whole place was alive with music. Without thinking, I followed the others, like a sheep, up the red carpet. It’s a little ostentatious to have such a showing of wealth on display at a station where people catching trains overnight sleep here as they can’t afford a hotel room. The red carpet welcome. Photos Aleah Taboclaon © Used with permission. This is India though, where a growing contrast can be seen between those who have money and those who do not. As I looked at the faces staring at me and see their hands reaching out, trying to touch me, I see happiness. Despite what I am thinking, this is a ray of light for many of them. I bowed my head to receive my scarf and present my forehead for the application of a bindi. This was to be the first of many I received over the course of the coming week. Flashes go off as person after person lined up along the red carpet to take photos of us all. They reach across to try and get a selfie (something that will become commonplace during this week). The official staff move us through swiftly, ever keen to protect us, but I wished just for a moment I could have taken some more time here. Suddenly, I’m on the train. The Golden Chariot. My home on wheels for the next week. My first ever time on a train journey more than a day. The first time sleeping on a train. It was to be a different adventure for sure. Note, this was obviously not taken at the official boarding. There’s no-one around! The accommodation carriages, all with individual names pertaining to a particular dynasty in the region of Karnakata, come in either twin or double settings. They are compact rooms, although I must admit I suspected they might have been a little smaller. The twin room has two single beds, both placed up against the wall or window. A small bedside table separates the two. The twin room also has a bunk bed, a heavy timber base that folds down from the wall, with a mattress on top. I would imagine this would really only be best for children. I personally couldn’t imagine sleeping up there on a rocking and rolling train! The beds are comfortable enough, but this is India, so expect the beds to be harder than what you might be used to. They are similar to many found in other parts of Asia also. All cabins are air-conditioned, albeit centrally controlled. A small wardrobe allows you to hang a few items of clothing up, but don’t expect to be able to unpack your entire suitcase into it. A large chunk of the wardrobe is also taken up by the safe. I found it easier to just keep most of my clothes in the suitcase, which I left under the bed. I took a medium sized suitcase that weighed approximately 15kg. This fit quite easily under the bed. Taking large suitcases is not recommended as there is just nowhere in this room to store them. If you are sharing the twin room with someone else, taking a small amount of luggage would be beneficial to everyone. Whilst the bathroom might look overly luxurious, one must remember that we are on a train. Having access to a private bathroom, with hot running water and a flushing toilet, are significant inclusions to have in this country, and more specifically, on a train. I only had one instance where my hot water was not working. A simple request to the maintenance manager and it was working again in no time. The toilet sometimes needed a bit of extra attention to get it to flush, but once again, at least we had one. Toiletries and bottled water are also provided. At the end of the bedroom is a small fold up desk and tv. The desk is very squeezy, so much so that when I needed to work, I either sat on the bed or went to the bar! At least I could have a beer there too. There are two electricity sockets in the cabin. One near the desk and another above the bedside table. You can read more here about the types of plugs that may be needed in India. I made sure I had all of them and I used them all in various locations. Wifi is only available on the Golden Chariot in the bar carriage. I wouldn’t rely on it at all though as it was mostly ineffective. It should be noted however that this is because the cellular networks in the south of India are not great, meaning there is limited data coverage in much of this area. How to buy a sim card in India. Click here! I know it might sound strange, but even though this was a train journey, we actually weren’t on the train that much. So, it was nice when we had a chance to just spend a few more quiet moments in our cabins to watch the world as it passed us by. The Golden Chariot has two restaurant carriages on board. Located on each side of the kitchen, they serve the same food in both carriages but allow the guests to swap around as they choose. All meal times have designated start and finish times. Mostly there are periods of 1.5-2 hours to enable everyone to eat, without having to rush for starting time. Eating on board is definitely a highlight with the chef and his team working hard to provide a variety of food for every meal. A mix of western and Indian food may be ordered and there was always a vegetarian and non-vegetarian option. Whilst I ate mostly Indian food for lunch and dinner, breakfast was usually a different story. With long days spent sightseeing off the train, I needed protein to start my day. Indian food is not big on protein in general, especially at breakfast, so eggs were my go-to option. Generally, I opted for the masala omelette which had sprinklings of tomato and onion. The chef would come out at every meal to check on our progress, or to ask me “why don’t you have an Indian breakfast?”. I always felt slightly guilty but promised him that I would eat Indian for lunch or dinner. Occasionally though he would offer some kind of southern Indian bread, like the inflatable, puffed up Puri. Poking a hole in this round bread full of steam and watching it escape, then deflate was always good fun and it tasted great too. Salads, soups, main meals and desserts were options at both lunch and dinner. It felt as the week wore on that we were always eating, and I felt sometimes I couldn’t do justice to a full Indian spread. On these occasions, I just selected several items that I wanted and the chef was only too pleased to accommodate. Being able to be flexible was made very easy. Masala tea and Indian coffee were also available at all meals, as were standard teas and coffee. Located in between a restaurant carriage and accommodation carriage in the centre of the train, the bar is the main public area where you can hang out, have a drink and a chat. Or, like me, it’s a place to get out of the confines of the cabin, in search of more space. Beer, wine and spirits may be purchased from here and put on your room tab. It is opulently decorated, but unfortunately, the windows have a coloured film over them, preventing a view. I understand the rationale as to why it is like this. As I mentioned in my opening, these types of trains attract great attention. With clear windows, people at the stations would clamber over to peer inside, perhaps unsettling some guests. Personally, I’d have liked to have seen clear windows and if something outside happened that people didn’t like, just opt to close the heavy curtains for a period of time. The bar was used for guest activities and even hosted a party one night complete with smoke machine, disco lights and DJ. A small gym with several machines offers guests the opportunity to keep up with their exercise program whilst onboard, whilst a massage and spa centre provides the opportunity for some pampering. There is also a small business centre available. Laundry services may also be ordered if required. I caught one of the passengers taking time out one morning to read the paper in the mini lounge areas set up between some of the carriages. Whilst it is a bit of a freeway for passing internal traffic, it is nice that there are areas outside of the cabin and bar where people can relax. Various activities are provided on the train to keep guests entertained and to stimulate different experiences. I was delighted to be able to participate in a cooking demonstration lead by the Executive Chef. Usually, I’d be happier being able to participate more actively, but this just isn’t possible on a train. One night we arrived back at the train to find two ladies waiting to cover us with their art of henna tattooing. We were late arriving back to the train, and we were told that we only had 40 minutes to get them done as the train would be leaving the station. With 12 girls in our group, there was no way we would all get done in this time. Or so I thought! These women are highly skilled in the art of decorating all parts of the human body, with small tubes of henna dye. No sooner had we sat down in front of the women, hand extended and the henna dye was being twirled and swirled on our hands. Without any form of stencil, our patterns developed quickly in front of our eyes, each one of the 12 drawn was completely different. They took several hours to dry. I couldn’t believe that I didn’t smudge mine! Once dried, the black flakes off, leaving behind a much paler, brown coloured tattoo, that for most people can last up to two weeks. Whilst I was happy to be included in this process, and it was certainly a different experience for me, I hated having it on my skin. Not being a tattoo person, I honestly couldn’t stand looking at it on me. I kept washing it to make it fade and eventually it was gone in a few days. 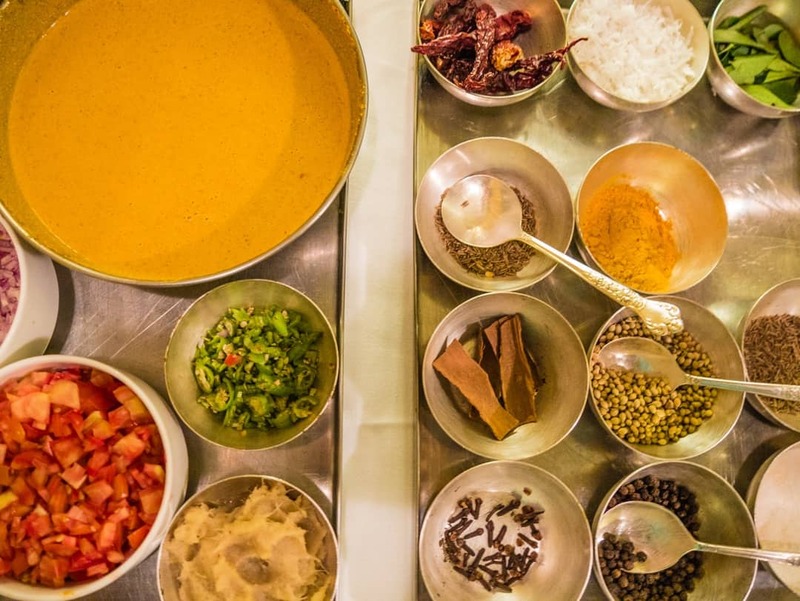 As a means of mixing up the delivery of food, one afternoon we were treated to an Indian speciality being made in the bar carriage. Whilst we all took advantage of some downtime in the bar to chat and have a cool drink, there was much activity happening close by. The puri is the small round hollow ball. It can be filled with such things as flavoured water, potato, spices and chickpeas. My water, the jal-jeera is the traditional water, flavoured with spices. Each carriage has its own butler, usually a group of young men, willing to look after your every need. From assisting with luggage, bringing a cup of tea to your room, giving you access to a hair dryer, or even in my instance, ironing a shirt for me. I have to admit to being mortified when I asked for an iron. You know me, hate anything with wrinkles, but given my luggage restrictions this time, I had to leave my travel iron at home. I buzzed for my butler (a “feature” I tried not to use as I don’t really like summonsing people) and asked for the iron, shirt in hand. Before I knew it, he had whisked the shirt from my grasp and he was off. A short time later, my shirt reappeared, wrinkle-free. The butlers are available, on call if you like, 24 hours a day. They sleep at the end of each carriage, ensuring that they aren’t too far away should you need them. My favourite part was seeing our guy (pictured below) on our return to the train each evening. Standing by our carriage, he would have some hand sanitiser, a fresh face towel and a tasty drink. His face would light up with a huge smile at the sight of me and my standard line, “Did you miss me?”. These guys work extremely hard to ensure that all guests have a hassle-free experience and I imagine some guests would use their services more often than I wanted to. The service is where the Golden Chariot truly stands out. Nothing is too much for anyone. The chef, with his visits to the dining rooms during every meal, makes sure that everyone is happy with their food. If anyone has a special request, he is sure to carry it out if possible. The front of house supervisors were also always visible, making sure you are getting fed, getting a drink and being looked after in general. Prakash and Shiva (pictured with us below) looked after us with such enthusiasm, making them feel part of our team for the duration of the trip. They also accompanied us on the day trips, ensuring we got on the bus when we needed to, found bathroom facilities for us, looked after our belongings and generally kept us safe. Whilst talking with an English guest one day, she had a great story about the level of assistance she received for a medical issue. Having hurt her back during one of the sightseeing trips, she opted to stay on the train the following day. The staff looked after her all day, bringing her tea and snacks and checking in on her to make sure she was ok. With her back not improving, they found a local doctor, took her to that doctor, and then went to fill prescriptions that she had received. This is the type of service that makes a special mark on those who are impacted by such events when on holidays. This will no doubt surprise you to realise that you actually don’t spend as much time on the train as you might think. I know I was surprised with how little time we spent on it. Most mornings we were up early, having breakfast before we ventured off for a day, and sometimes evening, of organised events. From magnificent palaces to ruins, jungle safaris, shopping, beaches, cultural dancing events and temples, there was literally never a moment to spare. On most occasions, we were back on the train by 7 pm but one evening was quite late around 10 pm. Air-conditioned coaches (buses) were used to transport the guests to and from these locations. Unfortunately, some of the locations are quite some distance from the train station, so at times we were on the bus for hours at a time. India is a large country though, so travelling long distances by road and rail are quite common. The train travels mostly through the night, rocking you to sleep, and arriving at the next station during the night or early the next morning. It was really only on our way to and from Goa that we got to spend more than a few hours on the train, and during daylight hours when we could see outside. This is a brief summary of where the train goes over the course of the week. There’s so much for me to write about here, plus all the amazing photos, that I will leave it to another article to discuss in more detail. Shravanabelagola (note whilst this is the usual itinerary, we weren’t able to go here due to a one-in-twelve-year event being held). Instead, we went to the Serai Coffee Plantation. Lunch and free time at resort. Visit beach. Every night a card was placed in our cabin, providing us with details of the day ahead: where we would be going, key sights, details on lunch/dinner and tips on what to wear. On the reverse side, a summary of the locations was also provided to give some background on the locations we would be visiting. These were extremely helpful. The cost of this journey is something that I have given quite some considered thought. At approximately $6,000 USD for an eight-day, seven-night journey, it’s a significant investment. With many choosing to travel as a couple, the cost suddenly becomes an important factor. Whilst getting a return on investment is not a term usually associated with travel, I feel it should be in times when the entry price is so high. Unless of course, money is of absolutely no concern to you. Obvious inclusions are the journey itself, all meals whether taken onboard or as part of a daily excursion and entrance fees for visits to all sites. Tea, coffee and water are also included. Alcohol and soft drinks are not included but may be purchased on the train or at the restaurants off-site. Tips are also not included. There is no pressure placed by any of the staff at any time to tip however it is a clear policy that if you do, it should be a group one. A gratuity box is left on the bar throughout the duration of the train journey, where you may place any tips you are comfortable with. Tipping individually is not sanctioned to ensure that those staff with less “front of house” access to guests, but who work equally as hard to deliver the experience are not left out. Purchases on the train may be kept on a tab, with payment made on the final day. Credit cards and cash are also accepted. My source of direct comparison is the luxury barge we were on last year in the south of France. Our journey aboard the Savannah was seven days, six nights and cost $5,000 USD per person. This was the pinnacle of luxury in every form of the word but more tellingly is the inclusions. There was simply nothing we needed to spend extra money on all week. Everything, as one would expect on a luxury cruise with a price tag like this, was included. The strongest tip I can give here is to book it through a reputable travel agent. There are many different websites, some of them look and feel like they might be the official website, but they aren’t. I know all my early research was conducted on the incorrect one. Would I recommend the Gold Chariot? So, I guess it all comes down to this. Having travelled on the Golden Chariot for a week, and knowing the cost of such a trip, would I recommend it? The answer is yes, but like always, it will come with some additional comments. As I’ve mentioned above, I do believe the current price is expensive, when compared to other types of organised travel. However, it is always difficult to make exact comparisons, especially when comparing a train trip to say a boat or bus tour. However, I don’t think I’m alone in this assessment which is supported in a way by a recent press announcement which highlights a decision to reduce luxury train fares and review the overall business model with a view to increasing occupancy. Having had my say on the price, I’m now happy to leave that in the background and focus on the reasons why I think it’s a great way to travel in India. Having travelled now through some parts of India I’m able to quite clearly say that this is luxury. It mightn’t be my normal definition of luxury, but by Indian standards, it qualifies. I know there will most probably be an uproar of people telling me that I haven’t travelled in India for long enough to be hard on it, but that is why this is my opinion. I found travelling in India, even with a partner extremely tough, in ways that were more of a mental nature than anything physical, although there’s plenty of that too. But, that’s for another time, another discussion. 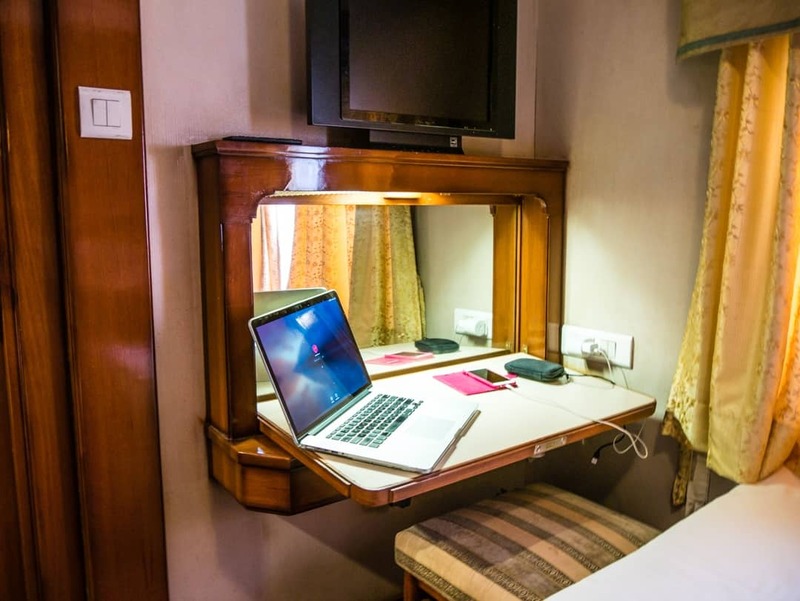 Travelling on the Golden Chariot is a safe and highly organised way of travelling. Organised travel is not something that I am usually a huge fan of, but in India, in the south, I think it makes sense. From the moment you attend the official welcome, to the moment you are delivered back to the train station at the end of the week, everything is looked after for you. So much so that I needed to remind myself to collect my luggage when I got to my hotel. Unlike in other areas and on commuter trains, everything is safe and secure on board, including yourselves. Cabins are lockable and doors to the main carriages are kept locked. When stationed, open doors are protected by the staff on the train. Wherever we went, wherever we were, someone was always keeping an eye on us, in a very discreet way. The food is of high quality and conditions on board the train and in the kitchens are clean and hygienic. Whilst I still avoided fresh fruits and anything raw, the food we ate on board was excellent and I heard of no reports of any guests being unwell. This is a significant factor and one that should not be underestimated in terms of its intangible value. The facilities are good. Private rooms and bathrooms in comfortable surroundings, with a butler on hand, means you should want for nothing on this train. The itinerary is very interesting, if not a little jam-packed and takes you to places that many people have never heard of in India. All the logistics are taken care of from bus travel to lunch and dinner locations off the train, tours and sightseeing. It would take a lot longer to do this itinerary by yourself by the time you had to organise your transport, places to stay, eat, sightseeing etc. Taking the train is a brilliant way of exploring the south and the activities are well organised and very thorough. It’s a perfect trip for those who especially love trains! It’s also a good fit for the more non-adventurous travellers or for people who are nervous about travelling in India. With the price tag, it’s not going to be appealing to those travelling on a budget, nor will it be for the highly free-spirited. Pack lightly. Overloaded suitcases will be difficult to manage and store. Keep an eye on the weather. We travelled towards the end of February and it was starting to get quite warm. Buy a local sim card to ensure you have data/phone access as much as the network will allow. You don’t need a huge amount of cash. Everything you buy onboard can be paid for by credit card if you wish. Cash is needed only for tips and anything you might buy when you are off the train. As a guide, the only time I used cash, other than for tips was for drinks at the resorts and coffee to bring home from the plantation. If you do need cash, it’s best to make sure you have it before you board the train. When the train is moving, it can be quite rough, rocking from side to side. Without exaggeration, one night I felt like I was going to fall out of bed. The Indian railway tracks are old and uneven, causing the train to roll about. If you are even a little bit susceptible to motion sickness, I’d recommend taking some medication or travel ginger tablets. The train can also be noisy when moving at night, so if you are a light sleeper, take some earplugs and an eye mask. Whilst I didn’t need them (on this part of the trip), any travel to India raises the possibility of travel illnesses. Consult your doctor and ensure you have any relevant medication with you. Take a universal travel adapter and also a power bank for your devices. As we spent a lot of time on the bus we had limited access to electricity for charging devices. Unless you like being by yourself, take the time to get to know the other guests travelling with you. Some people lead such interesting lives and it’s always great to have a chat. As you would expect from me, be sure to know when “Happy Hour” is and when it starts. When we were there, it started at a bizarre time of the afternoon when everyone was quite busy and stopped just as everyone was coming to the bar for a drink! As I said, pack for this trip as lightly as you can. I stayed on for another two weeks after the train journey ended, with the same amount of luggage. Many of the airlines that fly here have limits of 15kg before the ticket price goes up, so it makes sense to keep everything as small as possible. Even whilst I say this, I hate it as packing lightly is not my thing! Covering up is really the best policy when it comes to India. Not only is it respectful, but it (kind of) reduces the amount of attention you might attract, and it protects you from the hot sun. The trick is to have light clothes, that move and breathe, and don’t weigh you down when it gets hot. I didn’t find India humid at all during both February and March however many of my Northern European fellow travellers said it felt humid. You should, however, take a warm coat for the jungle safari at least. The temperature drops off in the evening and early morning here. I wore long cotton pants most of the time or cotton dresses. I took a variety of scarves, although these multiplied during the week as we were given many as part of various welcome presentations. These are useful for covering shoulders and are essential in some temples and churches. Long shirts or t-shirts were my other staple. Despite it being a luxury train, there is absolutely no need to dress up to the nines for dinner, although of course if you want to, by all means! It will just mean more luggage. Because we arrived back at the train usually just before dinner time, most of us just went to dinner in our day clothes. It was only when we had time on the last few days to have a shower and relax before dinner that we changed clothes. As far as shoes are concerned, keep it simple. Heels are not required for women for any event. A good pair of flat comfortable walking shoes with good grip is a good idea along with a pair of sandals or flip-flops. We took our shoes off many times when visiting temples, so having ones that are easy to get on and off are an advantage. Take sunscreen, some kind of insect repellent (useful for the jungle), a hat and sunglasses. I used a Life Straw bottle the entire time I was in India. If you are the type of person that gets hungry during the day, perhaps take some snacks with you as you don’t really have an opportunity to eat between meals. Sanitiser was my constant companion as were anti-bacterial wipes and tissues to use for toilet paper. Toilet paper isn’t common in Indian toilets. As you might expect in a country as geographically spread as India, the weather conditions can vary from north to south, region to region. In very general terms, the best time of the year to visit is September to March. In March, the temperatures really start to heat up, with cities like Delhi experiencing mid forty degree Celsius temperatures. October through to February are the coolest months. July to September is when the rainy monsoon period impacts the most. The Golden Chariot offers a range of journeys from September to April each year, so this largely determines when you can go, but, as noted above, these are the best times to visit. Bengaluru is serviced by the Kempegowda International Airport, located 40km north of the city. It is the third largest airport in terms of air traffic in India and caters to both the domestic and international traveller. Many international destinations will first travel through other cities as a gateway to Bengaluru. Flights to and from Bengaluru are so inexpensive it would be my only choice, hands down. It’s a quick, clean and easy option to take. Note: Getting to Bengaluru from the airport by road is a lengthy process and you should allow at least one hour to get to and from. The traffic in the city is significant, especially at peak hour. Getting there by road outside of peak hour stills takes approximately 45 minutes. Even though this article is about train travel, I am never going to recommend getting a train if you are elsewhere in India and need to get to Bengaluru. Yes, the trains are even cheaper than planes but there is no comparison. If you do need to use the trains, it’s a complicated process to set up an account in the first instance. You can do so here. In a city of 10 million, there are plenty of places to stay. As mentioned earlier, the Taj West End would be a good place to stay, given its role as the scene of the official welcome. I stayed at the WelcomHotel Bengaluru, a five-star hotel run by the ITC Hotels chain. It offered exceptional value, with a spacious, luxury room and excellent food and other facilities. I spoke to Executive Chef, Dhaval Ajmera for quite some time one afternoon, taking him through our journey on the Golden Chariot. Of course, he was most interested in the food we had on board. CHECK OUT THIS GUIDE TO INDIA – WRITTEN BY AN EXPAT NOW LIVING INDIA. Beer and Croissants was a guest onboard the Golden Chariot of the Indian Ministry of Tourism as part of the Incredible India campaign. We greatly appreciated this, but as always, all opinions are always our own. A very special thank you to everyone who was involved that week, especially the team onboard the Golden Chariot. This looks like a really fun time, and quite glam too. I also have images of folks hanging from trains in India, stuffing hundreds into a few cars. But this is a complete change up. Cool to see a few of my travel blogging buddies in that image above! They were a good bunch of people Ryan! A fascinating and in depth review. I’ve always wondered what these train journeys in India were like. You’ve provided a great resource! Loved reading it. ? Hi Tilly, thanks so very much. It was certainly a very interesting trip. Omg this looks incredible! I was like I am totally doing this next time till I saw the price hahaa.. wow what an astronomic amount, especially considering India salary, etc. this is just for the real real privileged ones in there.. but still looks epic! It is so wonderful Kiki but yes you are right, there is a large pricetag. The govt is reducing prices at the moment though.